Biodiversity markets include any payment for the protection, restoration, or management of biodiversity. Just a small sample includes: biodiversity offsets, conservation easements, certified biodiversity-friendly products and services, bioprospecting, payments for biodiversity management, hunting permits, and ecotourism. 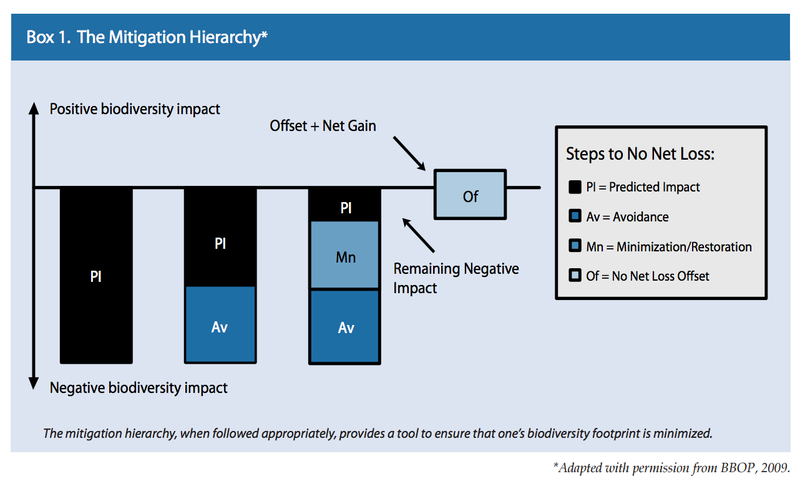 Biodiversity market mechanisms are increasingly structured around the ‘mitigation hierarchy’ which establishes that market-based tools should be used only after efforts have been made to (first) avoid, (second) minimize, and (third) mitigate negative impacts to biodiversity (Box 1). 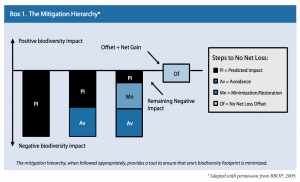 Compensatory mitigation is a spectrum of practices that range from rigorous and measurable biodiversity offsets to less direct efforts to compensate for impacts through financial donations and land protection. What drives biodiversity markets? There are three main motivations behind the demand for biodiversity offsets and other compensation mechanisms: regulatory compliance, government-mediated payments, and voluntary provisioning. In a regulatory compliance setting, the government sets a limit on the negative impact to a species or habitat and then allows the market to resolve the cost of offsetting impacts above the limit or ‘cap.’ For example, in the United States, the Endangered Species Act limits harm to federally listed endangered species and requires any company or organization that exceeds that limit to follow the mitigation hierarchy. If certain impacts cannot be avoided or minimized, the remaining mitigation obligations could be fulfilled by purchasing a credit from a private conservation bank that has restored, managed, or preserved habitat for the species in question, or by making a financial contribution (known in the U.S. as an in-lieu fee) to a program carrying out conservation projects. Through regulation, government creates a demand for biodiversity that government, the private sector, or non-profits can supply. Because the suppliers can sell credits to regulated parties that need to find appropriate mitigation for their impacts, the law provides a financial incentive to permanently protect endangered species habitat. Government-mediated payments can also be a driver of biodiversity goods and services. The government (and/or a non-profit organization) acts as a sole “buyer” by purchasing land or conservation easements or by creating payment programs for biodiversity stewardship activities. Finally, voluntary markets may create demand for biodiversity compensation. Companies may be motivated to voluntarily mitigate their impact of biodiversity because of corporate social responsibility policies, profit motivations, or consumer demand. Examples include: certified biodiversity-friendly products, donations for biodiversity conservation or research, positive public relations, ecotourism and recreation, and others. There are also voluntary activities that resemble compliance-based biodiversity offset schemes, but are conducted either in advance of coming regulations (pre-compliance), and/or for various goodwill and business-case reasons. Unlike carbon markets, where a range of project standards exist, compliance-driven mitigation markets typically rely on domestic regulator-set project performance standards and requirements related to monitoring, financial assurances, and long-term management. Meanwhile in voluntary markets, relatively few third-party standards have emerged. For species and habitat-driven projects, the Business and Biodiversity Offsets Programme (BBOP) Standard on Biodiversity Offsets is probably the best-known voluntary project standard. The BBOP Standard sets out principles, criteria, and indicators for project design and offers guidance on best practice in applying the mitigation hierarchy and offset design. The Standard was released in 2012. Following field trials and a consultation period, BBOP plans to re-release the Standard in 2016. To date, the Standard has been applied only on a voluntary basis. Conservation Bank – The U.S. term for a parcel of land approved by regulators to sell mitigation credits for endangered, threatened or other imperiled species or habitat. In-Lieu Fee (ILF) – A permittee pays a fee into a compensation fund program in lieu of creating their own offset or buying a credit. ILFs are run by government or non-profit organizations which use the funds to undertake offset activities. Mitigation Banking – A term used colloquially in the U.S. to refer to wetland and stream mitigation banking; in the global setting the term includes the banking of any environmental credit including species, habitat, ecological function or other. Permittee – The entity (e.g., developer) requesting a permit to impact a wetland, stream, or endangered species. Permittee-Responsible Mitigation – Offset activities that are created by the permittee (e.g., ‘do it yourself’). Umbrella Bank – A banking instrument sponsored by a single entity to establish and operate a regional banking program with multiple sites.